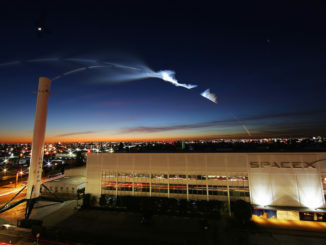 Six days after SpaceX fired its last Falcon 9 rocket from NASA’s Kennedy Space Center, another launcher rolled to historic pad 39A and ignited its nine Merlin 1D engines at sunset Thursday in preparation for a commercial satellite delivery mission Sunday for Intelsat. The two-stage rocket rolled out to pad 39A from SpaceX’s nearby hangar Thursday, and ground teams lifted it vertical on the pad’s launch mount around 1 p.m. EDT (1700 GMT). A few hours later, SpaceX’s launch crew loaded super-chilled, densified RP-1 kerosene and liquid oxygen propellants into the rocket. The nine Merlin 1D engines affixed to the base of the first stage ignited at 8:30 p.m. EDT Thursday (0030 GMT Friday), a few minutes after sunset at Cape Canaveral. The engines ramped up to full throttle — around 1.7 million pounds of thrust — and fired for around seven seconds, sending a plume of exhaust into the air and a dull rumble across the Florida spaceport. 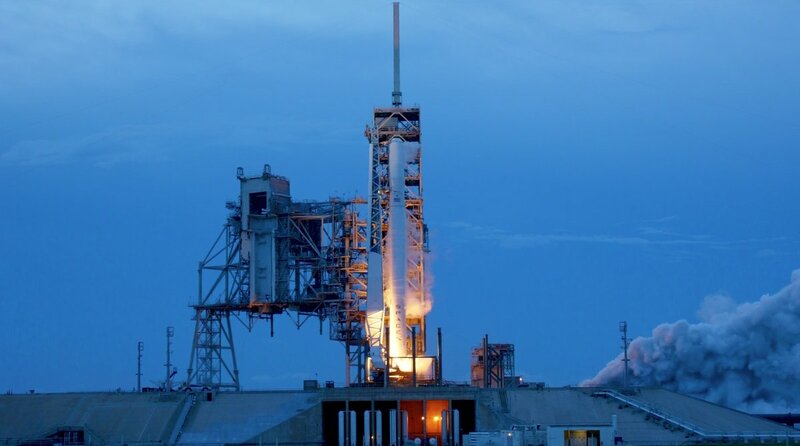 SpaceX confirmed the test on Twitter a few minutes later, and the hotfire keeps the company’s next mission on track for liftoff Sunday at 7:36 p.m. EDT (2336 GMT), weather permitting. Engineers will review data from Thursday night’s test before clearing the Falcon 9 rocket for flight in a launch readiness review. The flight will loft the Intelsat 35e communications satellite on a trip toward geostationary orbit, a perch nearly 22,300 miles (35,800 kilometers) over the equator. 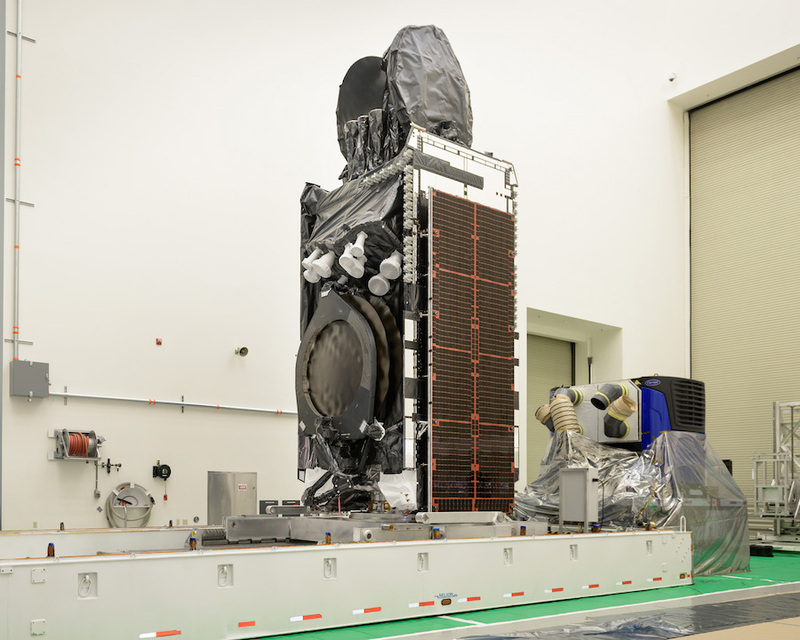 Built by Boeing, the Intelsat 35e spacecraft is set for a 15-year service life covering the Americas, the Caribbean, the Atlantic Ocean, Europe and Africa for Intelsat. SpaceX’s technicians will remove the Falcon 9 rocket from pad 39A as soon as Friday and roll it back to the hangar a quarter-mile away, where workers will connect the Intelsat 35e satellite and its protective payload fairing to the two-stage launcher. The U.S. Air Force weather team predicts iffy conditions could prevent the Falcon 9 from launching Sunday. Anvil clouds and cumulus clouds from storms expected across Central Florida have a 60 percent chance of violating weather criteria for a launch, forecasters said. If the Falcon 9 is able to blast off Sunday, it will be the third launch by SpaceX in less than 10 days. 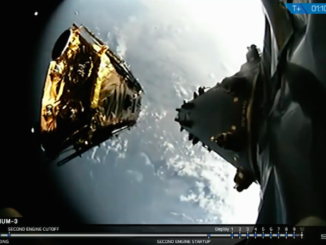 A Falcon 9 rocket took off June 23 from Kennedy Space Center with the BulgariaSat 1 communications satellite, then another Falcon 9 launched June 25 from Vandenberg Air Force Base in California with 10 voice and data relay spacecraft for Iridium. Both missions were successful and featured landings of the Falcon 9’s first stage on platforms at sea. 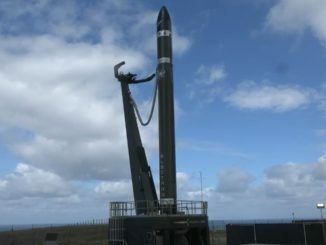 BulgariaSat 1’s booster made its second flight after SpaceX recovered, inspected and refurbished the stage following its first liftoff in January. SpaceX does not plan to recover the first stage after Intelsat 35e’s launch due to the satellite’s heavy weight. The booster is not fitted with the landing legs or grid fins needed for a landing.